My role: User Research, Contextual Inquiry, and User Testing (+ Visual Design). Discover how Rand McNally can utilise their wealth of maps and atlases with a game App. Research and analyse if Geocaching is the best way to utilise that data. We surveyed travellers to learn more about how they travel (alone/someone else), and to see where they get the information about their destination. We did contextual inquiry. This helped understanding what Geocaching was and how the user felt. My role during this activity was to be the user, while my group members took notes of how I felt during the process. Created a User Journey map to highlight the opportunities that we could later include in our design. Designed wireframes and prototype after doing design studio and user testing. Geocaching has a very small market and most of the users are travellers. Dismiss the idea of of creating a Geocaching App, but incorporate some of the elements of Geocaching in the App. Since Rand McNally is an Atlas company, create an App for travellers that uses their health of data. We did a lot of user research to understand the problem and come up with a creative solution. We delivered a working prototype. This prototype needs more iteration on the menu and some of the screens. Users were very satisfied with the idea of a travel App that creates an itinerary based on the user's interest. Going Geocaching helped us understand the user's motivations and goals. Contextual inquiry is very important when you want to fully understand the experience. Since we took the decision to not go with Geocaching as the solution, creativity was key to achieving our goal. Location based real life treasure hunt. User goes on the website or mobile App, gets the GPS coordinates of the desired cache, and goes on to find the cache. Once the user arrives, he/she logs virtually, manually or both. The user is able to accumulate logs. We created a presumed persona in order to develop an empathy map. This persona is a young traveler who likes to travel on her own. The purpose of this empathy map was to continue our research to discover more about people who like to travel. To get answers to our questions about travellers we developed a survey. The main goal of the survey was to find out how people travel (alone, with children, etc. ), if they use travel guides and why do the use them. Most people travel with other people. 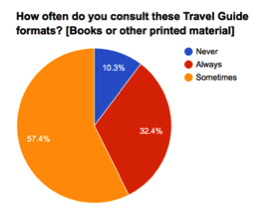 Most people use a travel guide when they travel. After interviewing people and doing contextual enquiry we wrote down in post-its what we have heard and experienced about geocaching. We created an affinity map to identify the different patterns. Conclusion: The hook for geocaching is the searching to find something. For our design solution, we can include elements of geocaching and leave some behind. Increase digital product presence while making the most of their existing data. Wants an easy, and fun way to discover, and explore a travel destination. A travel app that creates an itinerary in quest format, which utilises Rand McNally’s wealth of data. We did comparative analysis to get some ideas for what the design would look like. We incorporated features from these 3 Apps (Spyglass, Tinder and Two dots). We also considered the scenarios in which Edwina and Edgar could find themselves in to have a better understanding of the possible uses for the App. 1. Edwina has arrived to SF with her boyfriend Edgar and they want to explore the city together. 2. Edwina captures memories while she is exploring San Francisco. 3. Edwina wants to relive her journey of San Francisco when she is back in Australia. After we finished doing comparative research, setting the different possible scenarios and taking into consideration the opportunities of the user journey map, we did a couple of rounds of design studio and completed the first sketches. We used Sketch to digitalise the wireframes that we had previously designed. We took some design decisions based on the User Research previously done. Here are our most important interaction screens. - Show where you are in the map. - Users had problems using Hours/Places/Days. - Have the option of “save for later” referring to the destinations. - Get some kind of rewards along the way- gamifying the experience. For our final Prototype we used Invision to show how the App works. Task: Edwina visits San Francisco and wants to create a quest based on her interests. We thought about the next steps in order to make Travel Quest a better experience for the different users. Incorporate augmented reality in the App. Have the option of sharing data through bumping the phone. Add different rewards along the way so the user feels more engaged. Being able to share the experience in social media. The challenge of this project was that the brief was very broad and we had no restrictions for the solution. Having so many options give us the opportunity to explore different solutions through creativity. Our group went from not knowing what geocaching was to creating a design solution for travellers which included elements of geocaching.